And Another Thing...: Mark Haim: all we need is love! Mark Haim: all we need is love! 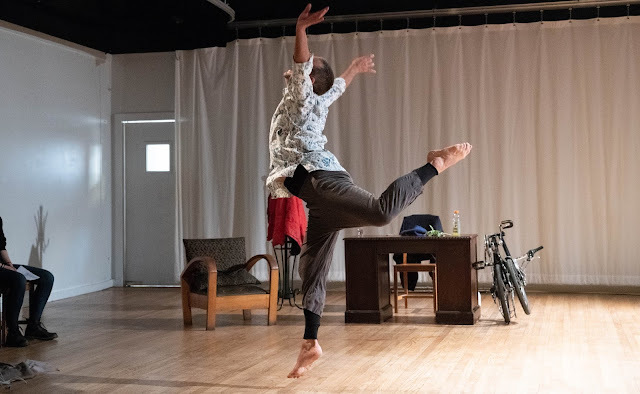 Mark Haim contains multitudes in "Parts to a Sum"
I didn’t plan to write about Mark Haim’s new solo “Parts to a Sum,” at Seattle’s Velocity Dance Center. After all, I am one of more than 350 people who answered Haim’s invitation to submit very short videos of ourselves in motion. His idea was to learn portions of all of these movements, and compile them into an evening length piece. I'd seen pieces of the work in progress, and when I went to Velocity on Saturday evening, I left my notebook in my backpack. To write about this solo felt like it would be some kind of conflict of interest. But midway through the first section, my mind started to swirl and I itched to have my pen and notebook at hand. The solo is divided into three sections; when the first break arrived, I dug out pen and paper. Walt Whitman's line "I contain multitudes" had popped into my head as I watched Haim. In his epic poem “Song of Myself,” Whitman wrote “do I contradict myself? Very well, then I contradict myself; I am large, I contain multitudes.” Whitman was celebrating his humanity: flawed, contradictory, imperfect. Haim picks up that celebration and expands on it; "Parts to a sum" is a celebration not just of our humanity, but of our connections to one another. It's a celebration of our collective existence. On its surface, the movements in “Parts to a sum” don’t awe, or even seem particularly fresh (although watching Haim flap his arms like an excited toddler, you get a new perspective on joy.) It’s in the way Haim has layered person after person’s submissions, his decision to submerge his own personality in order to shine a light on hundreds of others, where the power lies in this solo. It is selfless in a way that I think only somebody with life experience can be; Haim isn't out to strut in his own movements; he's here to honor all of us. 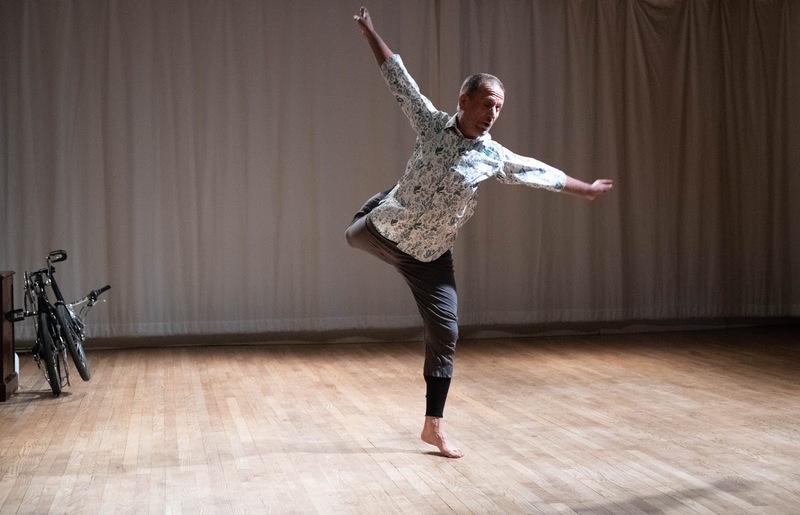 Mark Haim in "Parts to a Sum"
Part one is performed mostly in silence, or to a very faint soundscape with birdsong, chimes and the occasion wisp of a melody. The sounds evoke sense memories, the way the aroma from Proust’s legendary madeleine ignited a masterwork. The power is in its quietness. For the second section, Haim has created a soundtrack that mashes up popular songs much the way he’s mashing up our movements. The tunes are tantalizingly familiar, and just as we start to tap our toes, the music crashes against the next song in a John Cage-ian way. The impact is powerful indeed, a wonderful echo of the way he’s woven our movements together. The final part of this solo uses Beethoven as an aural backdrop; for me this might have been the only misstep of the evening; Beethoven’s grandiosity, which I normally love, threatened to rend the tender garment that Haim was weaving. Mark Haim leaps with joy in "Parts to a Sum"
In the program, Haim writes that he was inspired to make this work in response to the political climate, as a conscious choice to count his blessings and acknowledge his own happiness. In that acknowledgement, what he’s created is more than a tapestry of movement and sound; he’s woven a quilt of our shared humanity, an ode to our interdependence on the planet, a love song to us all. 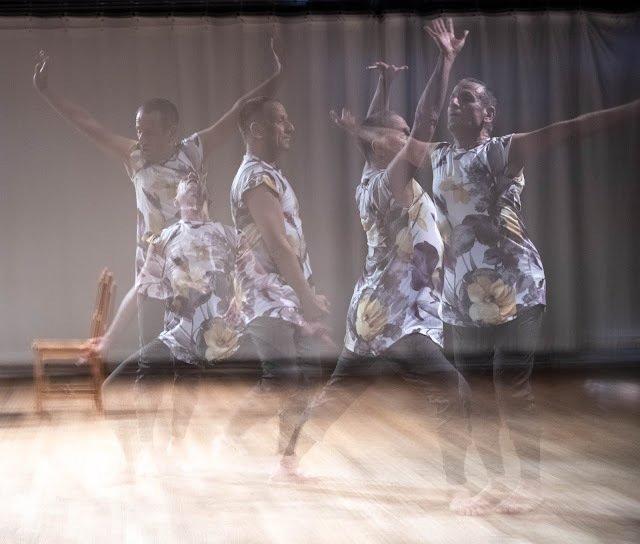 Haim will perform "Parts to a Sum" April 12-13 at Velocity Dance Center's Founders Theater.